This is a genus of about 30 species that live on Salicaceae in the northern hemisphere. 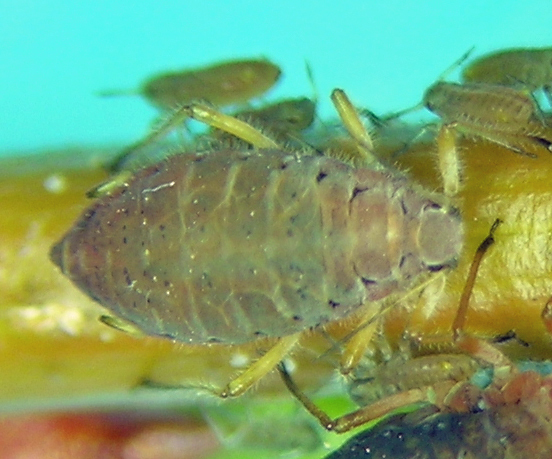 Aphids in this genus are among the largest aphids, and often live on the stems and branches of their tree and shrub hosts. They are usually attended by ants. In western North America, this is by far the most common species of Pterocomma. It is easily recognized in the field, and so I often walk past it rather than collect it (possibly a mistake, as mentioned elsewhere). Although the dogma is that this species is monoecious with males and oviparae in fall, I have never seen sexuales myself, and frustratingly, the first life stages I almost always find in the field are alate viviparae colonizing willows in the forest during bud break. So, these alatae are landing on willows just breaking dormancy, yet where did they come from? An obvious answer is that they are coming from lower elevations where spring came earlier, and this is likely the case. 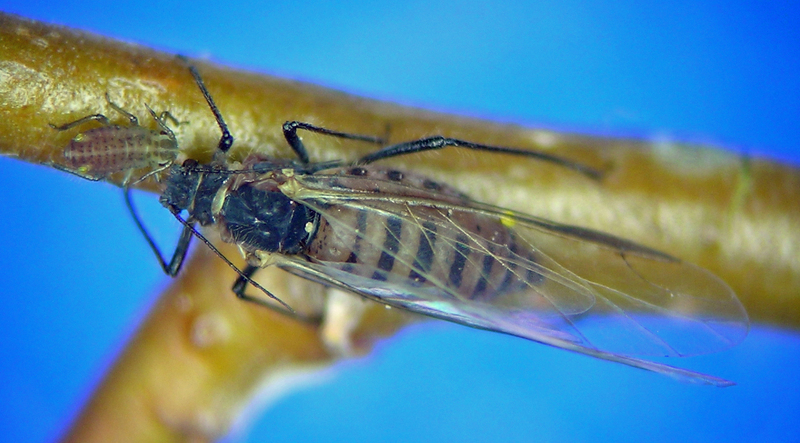 Such early season migration shows that although the accepted idea is that Pterocomma is monoecious, and that monoecious is usually equated with non-migratory, this aphid embarks on daring early-season migration from low-lands to mountains. Some day I may write about the truth of aphid migration as I see it from decades of field work in natural systems. Pterocomma bicolor, probably a fundatrix, from Douglas Canyon in central Washington in April. Pterocomma bicolor alate vivipara, having just arrived in the Blue Mountains from points unknown, colonizing Salix during bud break in early May.